The ice in question refers to my previous post from yesterday where I was talking about Ice Resin (did I mention how much I have enjoyed using that stuff?!?) and the snow, well, all will be revealed further down. Neither snow nor ice seem very seasonal to be mentioning in June, although it's another damp and overcast day here, so not very Summery really. Anyway, as mentioned yesterday, Personal Impressions have "unveiled" the new Christmas designs for this year and they should be available by early to mid July. 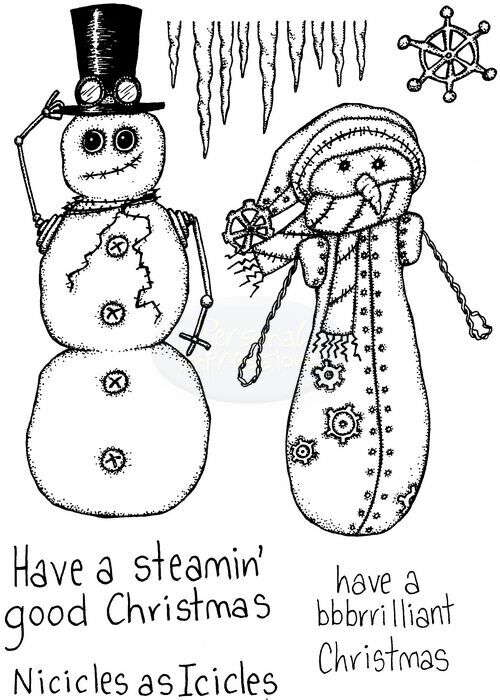 As promised, I will be showcasing my festive stamp sets here, though there are a lot, so it may well take quite a few posts! Hard to know which ones to share with you first, so I'll just go quite randomly I think. 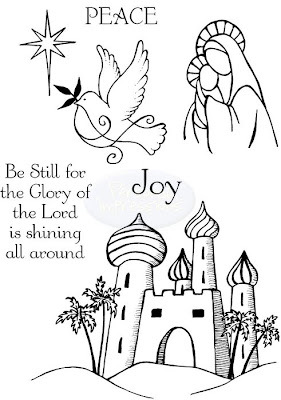 By the way, you can see all of our new designs on the PI website by clicking "products"....then choose either "Crafty Impressions" where you can find all our clear stamps, or "designed by Lindsay Mason" where you can find my Doo Lally Pip range as well as some of my other designs. I have designs in both sections - just to be greedy! Although the PI website is a trade only one of course, you can make a note of the reference number of any item and ask your local retailer to order it for you if they stock our products. 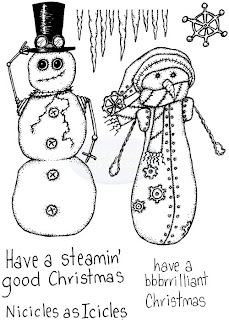 .....you know how I love snowmen, and I also love the whole Steampunk genre, so combining the two was a must! There is a Steampunk Santa face included too for good measure. I was obviously thinking of Abraham Lincoln when I added their stovepipe hats...they just kept getting taller as I drew! 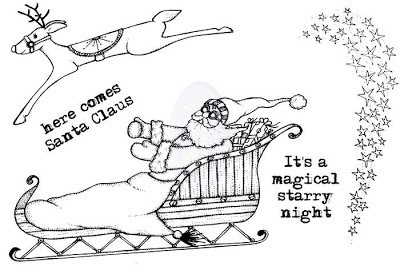 ......this one is entitled "Here Comes Santa" (CICSA6086). 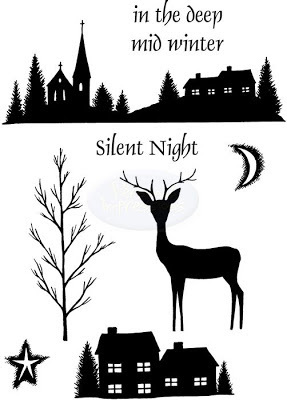 I'll be doing some masking with this set so I can have a few reindeer flying along in front of the sleigh. 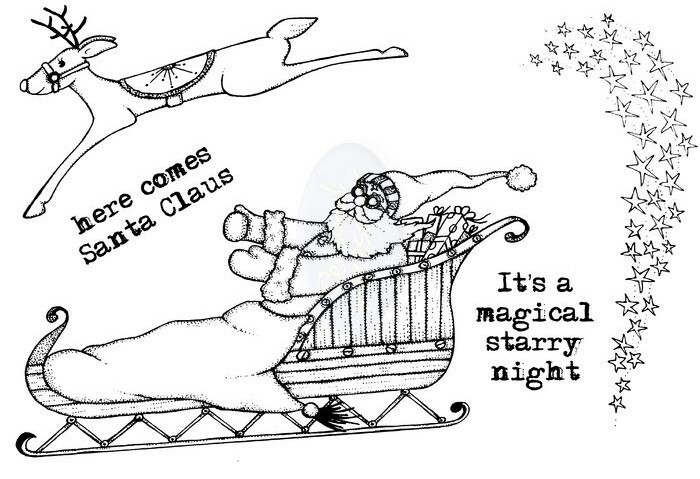 You'll notice that Santa isn't actually holding any reins but has his mitts out as if he is.....so, once all the images are stamped in place it's then a simple task of drawing a couple of lines to connect him up to his reindeer. This means you can play around with positioning much more. I think the starry burst will prove useful too. ........more Steampunk too as you can see. 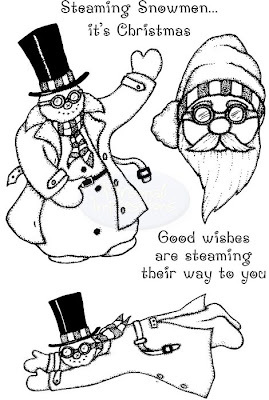 This set is called "Nicicles as Icicles" (CICSA6111) and if we do get snow later this year I am definitely going to try and re create one of these characters on my lawn! The icicle border is going to prove useful and, of course, individual icicles could double as carroty noses. I'm going to enjoy using this set a lot. 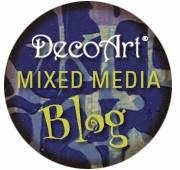 .....I can feel my alcohol inks being used rather a lot as well as some Dylusions ink backgrounds! I do love silhouette images and can't wait to get started on this set. The bare tree can easily be used throughout the year with a few well placed leaves, or, of course, it can just be stamped in from the edge of a card to create branches and twigs for birds to sit on. 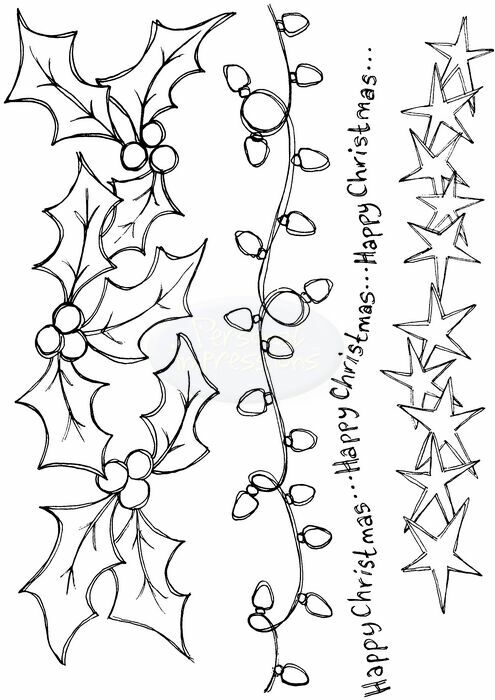 ......this one is called "Sketchy Christmas Borders" (CICSA6088) and I know I'll be making good use of this one in all sorts of ways. 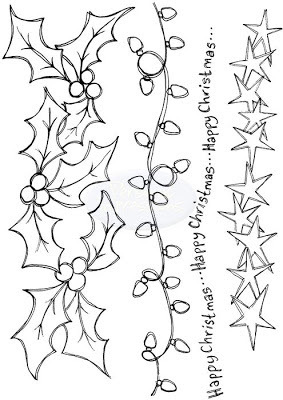 The holly can be stamped and cut out individually of course, to make up into dimensional wreaths, swags or nice additions to the corner of a card. ......the words are from the opening verse of one of my favourite hymns of the same name. It always brings a tear to my eye when we sing it in church. The images on this set are ideal for making quite small cards which I know I, for one, often make when I have to send them to a lot of people. Well, that's my first preview! There are lots more to show you though so I will be posting them over the next week. Today I'm not working as such, but just getting everything packed up and ready for my demo tomorrow at Dainty Supplies in Washington, Tyne and Wear. I'm going to be on pins all day as Heather and Graham are going to see the consultant at the hospital to find out more about where we are with Graham's illness and what treatments he may be able to have. Any prayers for them would be much appreciated. .....just don't look too closely at all the weeds that have come through again after all the rain! The dreaded Horsetail is back with a vengeance too...ggggggrrrr. My workroom is at the front of the house (I'm on a corner) so I get to see what's going on and wave to all the neighbours while I'm working! I was standing up taking the picture so it looks as if my workroom is upstairs - but I'm in a bungalow, so I'm downstairs! The back of the house looks across the fields and up to the nearby wood, so I have the best of both worlds really - the difference between the front and back views is quite dramatic! .....no dignity at all! She really is a little porker but it's so tricky when you have one pusscat who likes to pick at their food and go back to it and the other who guzzles everything down and then goes off in search of any further morsels to be had! That's my cherry tomato plant intruding on Tara's space. There are the first signs of crops now too....quite a few tiny tomatoes are appearing and the green bean has several very thin legumes sprouting. The courgette is now flowering too, so I'm looking forward to some home grown food very soon. Right, I'd better make a move or tomorrow's demo won't be happening! More stamp previews very soon. Have a great weekend everyone and thank you for all the lovely comments and the good wishes for Heather and Graham which we really appreciate.